Related indicator is available here. Hello! Can you add one more option (maybe called Opposite Wick Only) where it works similar to the Separated option (where it has two separate streams for showing both bars) but ONLY shows the wicks that are opposite of the bar type? So a bull bar would only draw the lower wick and a bear bar would only draw the upper wick, instead of both wicks being drawn for every bar. My strategy hinges on watching wicks on the opposite side of the main bar type, and being able to visualize it in an oscillating graph would help me A LOT! If this works well, I would easily consider paying for the rest of my method to be added, and have this converted into a full Strategy for automated trading. I would be happy to share it with the community as well. "Separated Opposite Only" option added. Works great, thank you for the fast change and response! Are you able to add an alert to this indicator when there is no wick at the bottom of the up candle and the no wick at the top of the down candle. You can try this version. So I'll just make one modification request to this indicator. 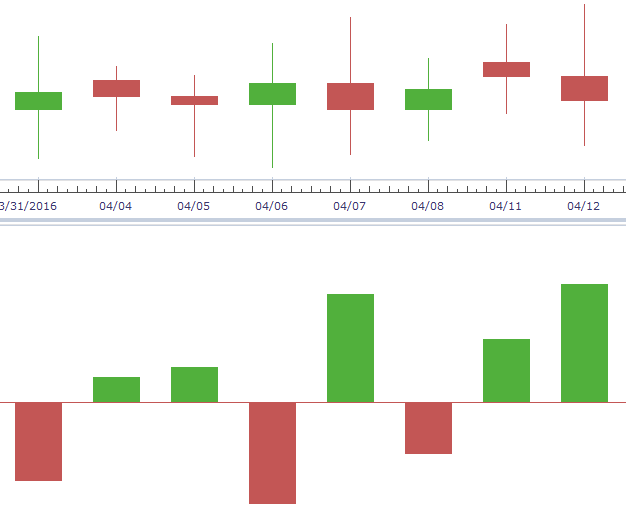 Can you add a 2 moving averages on the oscillator, one for low wicks and one for high wicks?